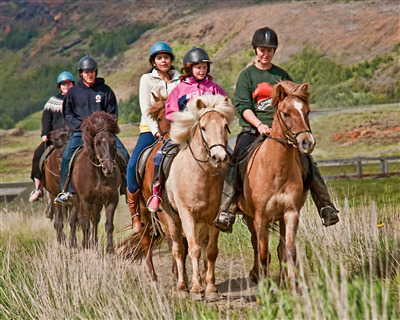 At Eldhestar we take special pleasure in showing visitors to Iceland the unique wilderness together with the horse. You'll get to know an Iceland you may not have seen before - the Iceland of 100 or 1000 years ago - endless meadows, rushing glacial streams, hidden valleys, dormant volcanoes, and high mountains. 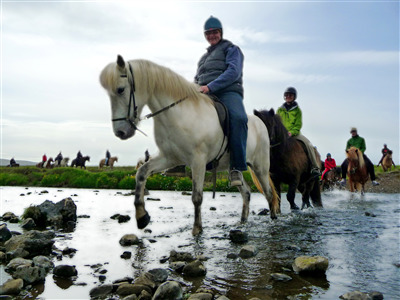 We offer itineraries that range from one or two hours to several days to suit riders of all ages and abilities. Since our founding in 1986 we have expanded our roster of tours to include most of Iceland. You are sure to find one that's right for you. All our tours begin at our farm Vellir, just a 30-minute drive from Reykjavík. In June 2002 Eldhestar opened a countryside eco-hotel right by the farm. Hotel Eldhestar now has 26 double rooms with all facilities, including internet connection, conference facilities, hot tubs and a dining room for 60 - 70 people. Our goal has been to create a warm and cozy atmosphere and at the same time a luxurious feeling. The farm also has a large, sheltered garden and rustic cottage accommodation for up to 20 people.